Shawnee State senior and Wheelersburg native Derek Moore signs baseballs for members of Project MORE last Tuesday against Milligan College. The Shawnee State baseball program poses for a picture with the members of Project MORE during last Tuesday’s doubleheader against Milligan College. When two strong forces combine to work together toward one common goal, the results usually work out in a positive light. 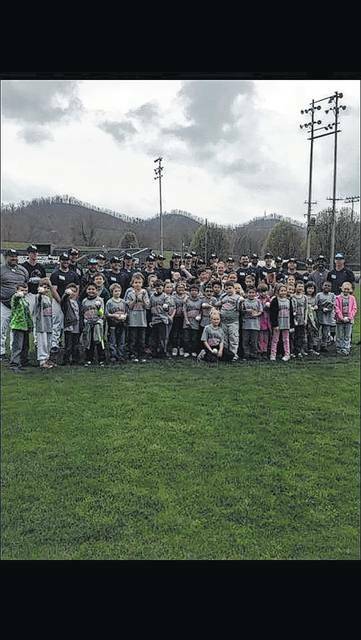 However, the accomplishments that Portsmouth Elementary and the Shawnee State University baseball program have obtained are never-ending — because the pair have combined to make lives easier for the kids. Over the past three years, the duo have worked together to grow a program called Project MORE (Mentoring Others for Reading Excellence), which is a program that has put together an individualized reading intervention program that is provided four days per school week for 30-minute sessions each day with the help of a one-on-one mentor that is focused on building reading skills for the students in question. And it’s been a project that has enriched the lives of all who are involved in the program, according to Angela Byers-Johnson. According to its website, Project MORE, which was formed in 1999, is an evidence-based reading research volunteer reading mentoring project for students with disabilities that has demonstrated statistically significant reading results since its inception. Independent research findings consistently report students with specific learning disabilities making month for month reading level gains when they are 1:1 reading mentored four times a week for 30 minutes — which is exactly what the Project MORE program at Portsmouth Elementary supports. Like the program itself, the positive influences that the Shawnee State baseball program has had on the elementary students in the Project MORE program is evident just in the numbers. When the Project MORE program was officially set into motion at Portsmouth Elementary in January of 2013, the program held 34 students. However, with the help of the Shawnee State baseball program — who began participating in the Fall of 2014 and has mentored the elementary students in the program since starting their own involvement — in addition to other generous volunteers, the program has seen a meteoric rise in the number of kids who are receiving the much-needed help. In all, 105 students are involved in the program today, which more than triples the total that Portsmouth Elementary had in the program to start out. As a result, more and more students have caught up to their grade level and their peers — which certainly makes the program a life-changing experience. That wouldn’t be possible without the persistence of Shawnee State baseball head coach Chris Moore, who saw the significance and impact of the program while serving as a substitute teacher at Portsmouth Elementary. Take the people who are involved, for example. Local players, such as Wheelersburg’s Derek Moore and West’s Brady Knittel are among the biggest supporters of the program, but even the players who held no ties to the Scioto County area have stood side-by-side with their fellow teammates in order to make a difference. Take Casey Claflin, a junior catcher from Cuyahoga Falls, Ohio, for example. Claflin not only fulfilled his required volunteer work with the program throughout the first semester but grew so close with a young boy in Project MORE that he has come back at least twice a week every week during the spring semester so that the child could receive the help that he has desperately needed. So it was only right if Project MORE gave back to the players that have helped uplift so many lives at Portsmouth Elementary. On March 28, the students in the Project MORE program attended a doubleheader between Shawnee State and Milligan College (Tenn.) at Branch Rickey Park, with many of the kids obtaining autographs, visiting the dugout, watching their tutor in action, and enjoying a fine afternoon of baseball — which proves that sports can be much more than just a game if the field is looked at in a proper manner.